In 2010 the United States experienced its largest oil spill disaster in our nation's history, and though the oil is no longer flowing into the gulf, the people in the region will be dealing with the after effects for quite some time. When such things happen, it's hard sometimes to put in perspective for children what is going on, and how it affects not just the people but the animals as well. 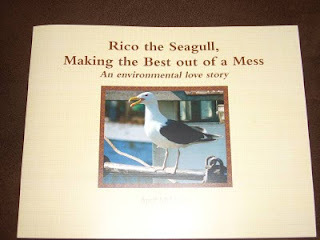 In author April Mahoney's book RICO THE SEAGULL, MAKING THE BEST OUT OF A MESS, we are able to get a bird's eye view (pun intended) as to how manmade events bring change to all living things. Told in the voice of a young seagull, the reader is able to take in the story, the sadness and joy, and relate it to a child's level so they can appreciate what the moral of the story is. Now, the book is great for young people, but don't think it should be limited to them. The message is one that adults should pay close attention to as well. We are all in this world together, no matter where we live, what we do or who we are. It is all of our responsibility to make sure that we are looking after one another and that we are mindful of the consequences of our actions. Rico's journey in life could very easily be any of our journey. I'm sure it is the writer's hope that we all learn to appreciate that fact before it's too late. 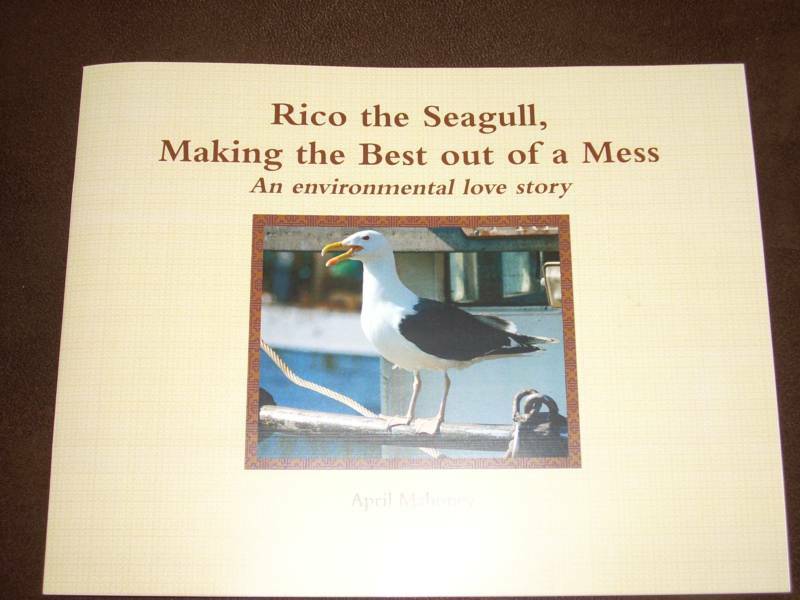 NOTE: RICO THE SEAGULL, MAKING THE BEST OUT OF A MESS was chosen as one of Conversations' Top 100 Books of 2010. To see the entire listing, go to www.thebestboookclub.info. (Monday, November 29, 2010) Though 2010 is quickly coming to an end, there seems to be no end in sight to the opportunities and successes of singing superstar Abraham McDonald. In an interview on Sunday, November 28, 2010 with Cyrus Webb on Conversations LIVE he talked about the past year and what has been the highlights for him so far. At the top of list? Seeing his mother's smile. McDonald told Webb that he was actually calling in for the interview from the video shoot for his Christmas single "I'm Giving You My Heart For Christmas" in which his mother and other family members are involved. When asked what advice he would give to others who had a dream they wanted to follow, Abraham answered: "Get up... You only have to do 1% of this thing. Your Source will take care of the other 99%. If heavy-listing is alot for you at 1%, it's not going to happen for you... You have to begin to think yourself forward. Ask yourself 'What should I do today?' Each day is an opportunity to do something towards your dream." Before the interview ended, Abraham told Webb that one of the things his fans should be looking out for in 2011 is a tribute for Luther Vandross he has done for TV One with Niecy Nash. To hear the entire interview visit this link: http://tobtr.com/s/1385263 . To stay abreast of other events with Abraham McDonald, go to www.mrabrahammcdonald.com. Cyrus Webb, Founder and Editor-In-Chief of Conversations Magazine, is pleased to announce that the December 2010 issue is now available. The magazine which began in April 2006 is back with more content, amazing contributors and a wider distribution. "This is truly a labor of love for all of us," says Webb, 35. "The Conversations Magazine of today is so much more than what I started with four years ago, but its evolution is a gift that I think everyone will appreciate." 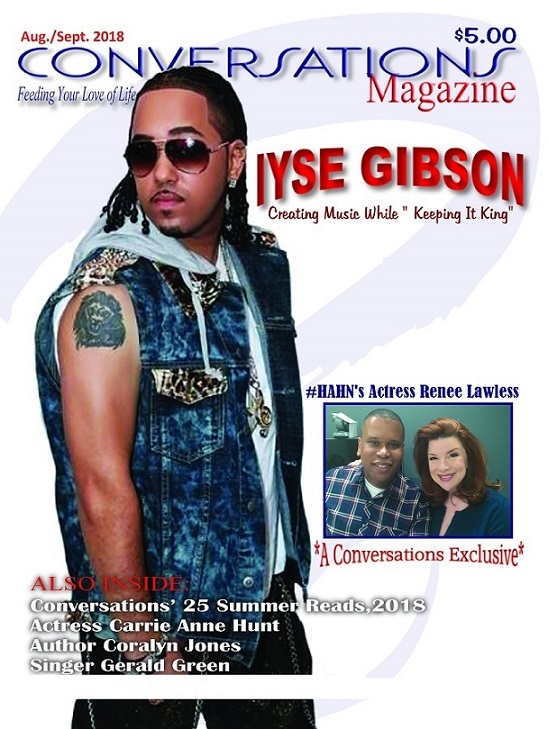 To get your copy of the December 2010 issue today for only $6.99 (shipping included), visit www.conversationsmag.com. You can also sign up for the 1 year (12-issue subscription for the low price of $24.99! Beginning December 1, 2010 the December issue will be available for download as a pdf for only $3.50 at www.conversationsmag.com For more information about the magazine and how you can be involved, contact Cyrus Webb at cawebb4@juno.com or call Stanley Clark at 1.773.315.9286. (Saturday, November 20, 2010) Mississippi may be seen as having one of the highest illiteracy rates in the country, but that is being chipped away each and every day by organizations like Conversations Book Club. 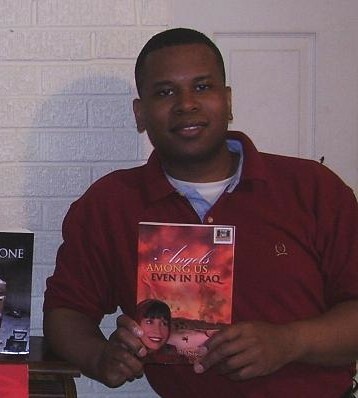 Under the leadership of Founder/President Cyrus Webb, Conversations Book Club began in Jackson, MS with only three members at the Medgar Evers Library in November 2006 but is now undesputedly the largest co-ed book club in the country with chapters in Mississippi, Alabama, Louisiana and meetings in Tennessee. Now four years young, Conversations is continuing its mission of providing something for everyone. On Saturday, November 20th, Webb hosted authors Joseph Henderson (I DON'T WANT TO DIE ALL ALONE), Diane Hassan (ANGELS AMONG US...EVEN IN IRAQ) and Tommie Watkins, Jr. (LIVING OUT LOUD) in events for the National Day of Reading in the cities of Jackson and Pearl in Mississippi. The day began with "Breakfast with Books" where patrons at the Medgar Evers Library in Jackson, MS were treated with refreshments and an opportunity to socialize with the authors. Stanley Clark, President of For The People Productions, joined the event as well. Being one of the founding members of Conversations, he shared his appreciation for the authors coming together to promote reading. At the end of the event, author Diane Hassan donated a copy of her book to the library, presenting it to librarian Shirley Simmons. The next stop was the Pearl Public Library in Pearl, MS. There authors Hassan and Watkins shared information about their books and talked about their individual experiences. There Hassan donated a book as well, presenting it to the supervisor on duty. Finally it was on to Appetizers Restaurant in Pearl, MS where the authors talked about their day and shared their plans for the new year. To date Conversations Book Club has scheduled events for 93 authors since it began in November 2006, with many more already planned for the upcoming months. To stay in touch with Cyrus Webb and the Conversations literary movement, visit www.thebestbookclub.info or contact Webb at cawebb4@juno.com or 601.214.0286. In 2009 ABC News reported that over 30 million Americans ages 16 and up were unable to read or write well. This proves what many have said for some time: Illiteracy is an epidemic that is spreading daily, claiming victims of all ages, nationalities and backgrounds. * 10-11:30a.m., "Breakfast with Books" at Medgar Evers Library (4215 Medgar Evers Blvd * Jackson, MS) featuring authors Dr. Diane Hassan, Joseph Henderson and Tommie Watkins, Jr.
* 1-3p.m., Meet & Greet at Pearl Public Library (2416 Old Brandon Road * Pearl, MS) featuring authors Dr. Diane Hassan and Tommie Watkins, Jr.
* 6-7:30p.m., Meet & Greet at Appetizers (3000 Hwy 80 E * Pearl, MS) featuring authors Dr. Diane Hassan and Tommie Watkins, Jr. Since November 2006, Conversations Book Club has hosted over 90 authors in events in the magnolia state to showcase the importance of reading. Those in the Central Mississippi area are encouraged to join in these free events and meet some exciting authors in the process. All events are free and open to the public, and all authors will have books on hand. For more information, contact Cyrus Webb at cawebb4@juno.com or 601.896.5616. After almost three weeks off the radio, Conversations LIVE show host Cyrus Webb returns with more exciting topics, incredible guests and new music heading into the holiday season. Listen to the show live at http://www.blogtalkradio.com/conversationslive or via the studio line at 1.347.426.3645. Missed the live shows or want to catch up? Simply go to www.conversationsliveradio.com. * Sunday, November 21, 2010 @ 10:30a.m. est (9:30a.m. est/7:30a.m. pt) --- Hosts Cyrus Webb and author Mary E. Gilder bring you a new edition of "Inspirational Conversations", featuring Mary's Motivational Message and Webb's book suggestion for the week. * Sunday, November 21, 2010 @ 7p.m. est (6p.m. cst/4p.m. pt) --- At the top of the hour, Cyrus Webb talks with author Antonio Damasio. At 15 min. past the hour, author Linda Jenkins discusses her new book, followed by author Robert Brown (at 30 min. past the hour) and finally at 45 min. past the hour, author Barbara Worton joins the conversation. * Monday, November 22, 2010 @ 1p.m. est (12p.m. cst/10a.m. pt) --- Host Cyrus Webb welcomes author Kristina Kilbourne at the top of the hour to talk about her new book. Then at 30 min. 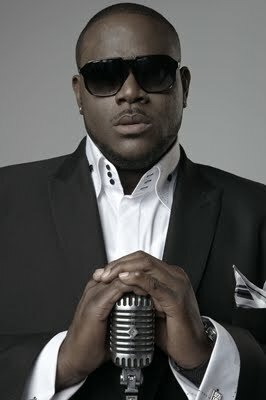 past the hour recording artist Tony Addison joins the conversation to discuss his new music. * Monday, November 22, 2010 @ 8p.m. est (7p.m. cst/5p.m. pt) --- Host Cyrus Webb brings you a special discussion designed for authors who are looking to make their mark in the world as we go into the new year! Join guests Susan Violante and Irene Watson as they talk about their own careers and how they can help you along your journey. * Tuesday, November 23, 2010 @ 1p.m. est (12p.m. cst/10a.m. pt) --- Host Cyrus Webb talks with Dr. Forte about her new book at the top of the hour, followed at 30 min. past the hour with a conversation with author Will Friedwald. Finally at 45 min. past the hour, Webb welcomes back author John Feinstein to discuss his new book for young readers. * Tuesday, November 23, 2010 @ 8p.m. est (7p.m. cst/5p.m. pt) --- Host Cyrus Webb welcomes back author Nancy M. Sellers to discuss her new book. Then at 30 min. past the hour author R. Oliver joins the conversation. * Wednnesday, November 24, 2010 @ 1p.m. est (12p.m. cst/10a.m. Pt) --- Host Cyrus Webb welcomes back author Phil Simon to talk about his new book. Then at 30 min. past the hour, author Buster Olney makes his debut on the program to talk about his new book. * Wednesday, November 24, 2010 @ 8p.m. est (7p.m. cst/5p.m. pt) --- Host Cyrus Webb talks with Teresa Rybolt about how she is using social networking to make a difference. Then at 15 min. past the hour, Webb welcomes back author/journalist Sasha Abrhamsky to talk about his book INSIDE OBAMA'S BRAIN, this year's mid-term results and what he expects to happen politically in the new year. * NOTICE: Conversations LIVE Radio is off the air Thursday, November 25th and Friday, November 26th, resuming on Sunday, November 28, 2010. * Sunday, November 28, 2010 @ 10:30a.m. est (9:30a.m. est/7:30a.m. pt) --- Join Cyrus Webb and author Mary E. Gilder for Inspirational Conversations. Start your week off with music of inspiration, Mary's motivational message and Webb book suggestion for the upcoming week. * Sunday, November 28, 2010 @ 7p.m. est (6p.m. cst/4p.m. pt) --- At the top of the hour, host Cyrus Webb welcomes back Island Def Jam recording artist Abraham McDonald to discuss his year, being named Conversations' Recording Artist of 2010 and to debut his new Christmas single "Giving You My Heart For Christmas". Then at 30 min. 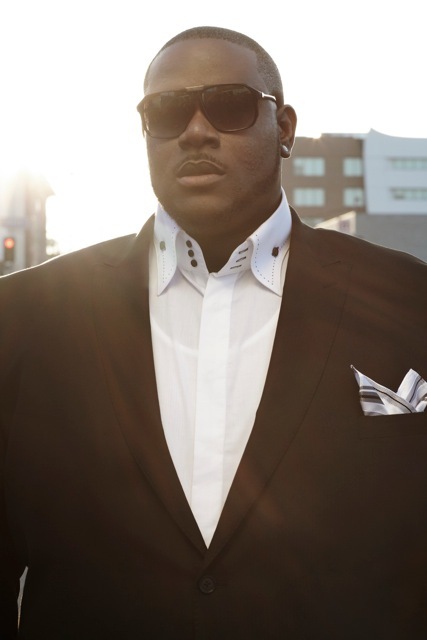 past the hour, Webb talks with recording artist Mordecai about his style, being named one of Conversations' Recording Artists To Watch In 2011 and what's next for him. * Monday, November 29, 2010 @ 1p.m. est (12p.m. cst/10a.m. pt) --- Host Cyrus Webb talks with author Daniel Walls about his new book. * Monday, November 29, 2010 @ 1p.m. est (12p.m. cst/10a.m. pt) --- At the top of the hour host Cyrus Webb talks with author Dorothy Guyton about what led her to writing and her new projects. At 30 min. past the hour, Webb talks with author M. Beatryce Shaw about her writing children's books with important lessons for all of us. * Tuesday, November 30, 2010 @ 1p.m. est (12p.m. cst/10a.m. pt) --- At the top of the hour host Cyrus Webb welcomes recording artist Anitra Brockman to the show to talk about her love of song and debut new music. Then at 30 min. past the hour, Webb talks with author Christopher Price about his newest read. * Tuesday, November 30, 2010 @ 8p.m. est (7p.m. cst/5p.m. pt) --- At the top of the hour, host Cyrus Webb talks with author Kenn Bivins about what led him to write his new book PIOUS. Then at 30 min. past the hour, Webb talks with author Cherie Hodges about her writing career and her newest book. 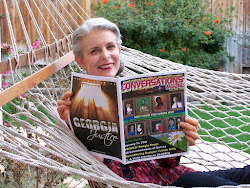 Remember that all shows by Conversations LIVE are available as free podcasts by going to http://www.blogtalkradio.com/conversationslive. There you can find all of our shows since 2008! To contact Cyrus Webb about being a guest, advertising on the radio show or the radion show website, email him at cawebb4@juno.com or 601.896.5616. 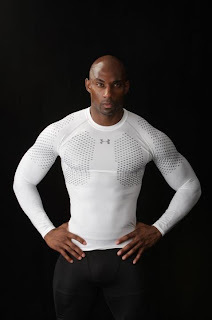 Stay abreast with his other activities by visiting his personal website at www.cyruswebb.com. He's a man that has lived the life that authors all over the world of every genre would love to enjoy. International bestselling author Andrew Neiderman was born in Brooklyn. His family moved to the Catskills of New York when he was an infant. Today, Neiderman claims he has been a writer all his life. He recalls being popular in the kindergarten during story hour. While in the 8th grade, he published his first poem in the Young Poet's Magazine. He is a graduate of State University of Albany where he was co-editor of the literary magazine and a creator of Suppression, an underground newspaper. He went on to become a teacher at the high school from which he graduated. Neiderman published 18 novels while teaching there. He taught English at Fallsburg High School for 23 years before leaving to pursue a career as a novelist and screenwriter. As a teacher, he served as department chairman, faculty president, county teachers association president, director of dramatics and wrestling coach. Eight years after Neiderman moved to Palm Springs, he published his most famous novel to date, "The Devil's Advocate." Aside from the fact that "The Devil's Advocate" is a film classic featuring Al Pacino, Keanu Reeves and Charlize Theron, Neiderman has over 100 million books in print and has been published in 95 countries. By that time in 1997, Neiderman had already published more than 60 novels, some under his own name and some as the ghostwriter for the best-selling V.C. Andrews novel series. A true testament to the power of Andrew Neiderman is the fact that he has been able to keep his own success while being a part of the great franchise that has come from the V. C. Andrews phenomenon. I was in junior high school when I was first introduced to her novel FLOWERS IN THE ATTIC, and since that time over twenty years ago, I have been a fan of the dark gothic tales that seems to always reveal more of myself to me through each book. At the time of her death in 1986, V. C. Andrews had over twenty four-million books in print and her estate was worth more than eight million dollars. Yet even death could not stop her stories from being told. Perhaps her writing career was cut short, but her legacy and stories never will be. Therefore, from now until the time her novels stop making its readers gasp, laugh, and/or cry, she will always remain unforgettable in the eyes of her fans. The newest book under the V. C. Andrews franchise, DAUGHTER OF DARKNESS <is already creating a buzz around the world. 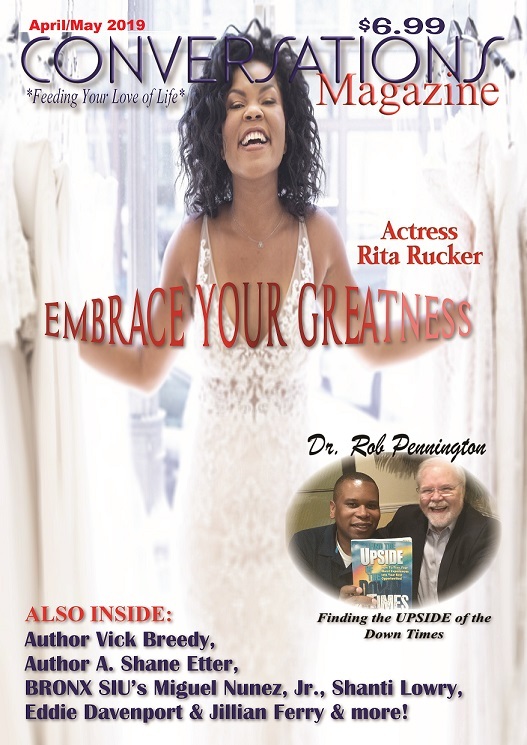 By the writing of this article, I have interviewed this incredible author 4 times for Conversations LIVE Radio*, and each time it is like catching up with an old friend. He has always been kind, generous with his time as well as humbled by all that he has accomplished. In 2010, Neiderman celebrated the release of his 100th book, showing his staying power in an industry that has changed dramatically since he first entered the literary scene. Here he talks about that career and more as we celebrate him being Conversations' Author of the Year 2010-11. Andrew, thank you for taking out the time to talk with Conversations. You have provided a literary voice for years to different generations through your books. What do you feel accounts for your longevity and your appeal with readers? I have always believed that the key to a good reader is the development of characters. Characters drive your stories. In my case I always begin with a what if question. For example, in NIGHT HOWL, I asked the question what if scientists were transplanting human brain cells into animals to see if they could improved intelligence and they did so with a German shepherd and that German shepherd got free and into population? The What if is there but now we need a character to drive the story and in this case, I chose a naturalist, a woodsman who is hired to track the dog and discovers quickly that it is a changed animal. He's angry science has created this creature, but he is likewise intrigued so he continues the pursuit. Stories, character and some edge or angle that will interest the reader is why I think my stories work well. If you were asked, how would you define your style? I began as a poet first so I always think about metaphor and love to write in a style that enables the reader to visualize, even if it is about feelings and thoughts. I am keen on the story moving along so I try to keep everything in the novel somehow related or key to the characters and the plot…no drifting…I always spend time on people, characters so the reader can see, hear the speaker. Worse thing is to overwrite. One of the things that stands out to me about your career is how you have been able to appeal not just to those who read your books, but also those who watch your stories that are adapted into television movies and features films? Do you think it is important to your success to use every medium at your disposal? In my particular case I taught film study for 20 years and I'm aware of the importance of visualization. 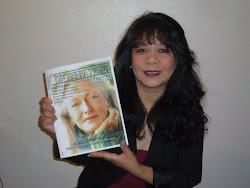 My books lend themselves to other medium because of that and in today's competitive market, it is very good to have the opportunity to drive not only publication but sales with your variety of approaches. Nothing illustrates that as well as my novel, THE DEVIL'S ADVOCATE. The movie opened thousands of readers to my books. When did you know that it was going to be a writing career that gave you the satisfaction in life that you wanted? I was actually telling stories in Kindergarten. I knew early on that writing was for me. I loved the written word and I have taken on every possible writing assignment to be involved with it. I have written speeches for candidates, advertising copy, historical information, one-act plays, poems and short stories. I published my first poem when I was in the 8th grade and never looked back. To me, writing is who I am and not what I do. Was your family receptive of your decisions in the beginning? Tell us about the beginning stages of your writing career? I had a very supportive family. I grew up with my maternal grandmother from Hungary living with us and she spent hours and hours telling me stories about the Old Country and gypsies and the like. I had an aunt who typed up all my written works for me and I had parents that were very encouraging. My father was a great storyteller as well. I attended Hunter college in the Bronx first and wrote for their literary magazine and then transferred to the State University of New York in Albany and became the editor of the literary magazine. While there, I established, with another student, an underground paper for poetry and short, short stories as well. I then went into teaching and published my first novel in 1971, SISTERS(Stein and Day, Pocketbooks, Inc) and I was off to a writing career that now has 86 published novels and books and one collection of one-act plays attributed to it, as well as two made screenplays. I think we all have defining moments in our lives where we see that the path we are on is going to work or not. When did you see things lining up the way you wanted them to professionally? My career began with SISTERS, but it wasn't until the publication of PIN that I knew I was headed for bigger things. PIN was a major best selling thriller for Pocketbooks and eventually a feature film. That began my pursuit with more ambition and vigor. It resulted in a multi-book contract and then eventually, another with Putnam-Berkley. Has there been a time, Andrew, when you look at the other books that are coming out in your genre and feel the need to compete in order to stay relevant? How have you remained true to who you are as an author? You don't compete in the sense of an athlete, but you keep up with what is selling and you study what it is that makes other authors and their works successful. You can't change who you are, but you grow and develop and hone your skill and talent along the way. A major author with whom I had lunch one day told me he was jealous of me because one of my novels had become a studio blockbuster…The Devil's Advocate, which cost 67 million to make. He had never a major budget movie, but he was making ten times what I was. Still, that shows how people envy the guy next door and sometimes lose the way doing so. Write true stories, only stories that you have a passion to write, and you'll succeed, for yourself at least. I think most people over the past decade or so have really gotten to know you as the ghostwriter behind the legendary V. C. Andrews novels that were published after her death. How did that opportunity come about and were you concerned how it would affect the titles that came under your own name? I had the same agent and editor at the time and stepped in when Virginia was unable to finish the novel she was doing. It is so different from my own style and stories that I had no worries about it disturbing what I was doing. How did you prepare yourself for such a challenge as finishing work that had been read by so many and was so different from your own writing style? I taught writing for 23 years and I was able to emulate another style because of that and my writing skills. I also made it a research paper in the sense that I studied and studied the other style. I enjoy all kinds of writing and love the challenge. Looking at the phenomenon that is V. C. Andrews, what do you think is the attraction to her titles after all of these years? Many, many writers have tried to imitate V.C. Andrews. They have not succeeded because there is a magic formula. V.C. Andrews captures the hearts of young people especially because the works address their needs, thoughts and fantasies. But the style and the stories are characterized by elements of so many genres it's difficult to copy. It's like trying to cook your grandmother's special stuffed cabbage. She had the same ingredients but mixed them in her own special way that no one else had or has and so it remains one of a kind. It's this mixture, this addressing real issues and problems and putting them in the V.C. Characters and settings that makes it lasting. Since it was discovered that you were the writer that the family of V. C. Andrews was working closely with, what has been some of the reactions? Most have been very positive and supportive because they want the stories to continue and love the style. There are a great many envious people who want you to fail. That comes with any endeavor, but for the most part, everyone is supportive. Can you give our readers some advice when it comes to following their dreams and finding their path in life? When I was a teacher, I directed school plays and after a particularly successful one, a student came up to me and asked me if she should be an actress. I said, "NO," and she nearly cried. "Why not?" she asked. "Because you asked the wrong question," I told her. "What is the right question?" she asked. "The right question," I said, "is Mr. Neiderman, I want to be an actress. What do I do next?" The point is so many people have talent but not the determination or the perseverance. You cannot reach your goals without it and that's why I often say, "It's 40 percent talent and 60 percent perseverance. Prepare for rejection and defeat but if it's in you to succeed, you will. Simple as that. Thank you again for this unique opportunity, Andrew. How can our readers keep up with your activities that are coming up? (Mon. Nov. 15th) Mississippi's Own Conversations Book Club Turns 4! (Mon. 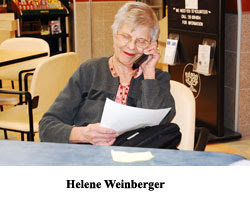 November 15, 2010) Conversations Book Club Celebrates Its 4-Year Anniversary! Since its debut on November 2006, Conversations Book Club let it be known that it was going to be a literary force to be reckoned with. Created by radio and tv show host Cyrus Webb of Brandon, Mississippi, the premise of the book club was simple: to get people talking about books. "I wanted to start a book club that celebrated all kinds of books," says Webb, 35. "I'm not a one-dimensional reader. I like a little bit of everything. That is the kind of reading group I wanted to form: a place where men and women could come together and have a great time with books." What started in Jackson, Mississippi with just 3 members has grown to over 100 members in Mississippi, Alabama and Louisiana. Conversations Book Club has hosted more authors than any other reading group in the country--- over 90 to date--- and it is the largest co-ed book club in the United States, having been featured by media outlets such as the Chicago Tribune, Associated Press and Fox News. The group has hosted everyone from New York Times Bestsellers to up-and-coming authors who have self-published their work. 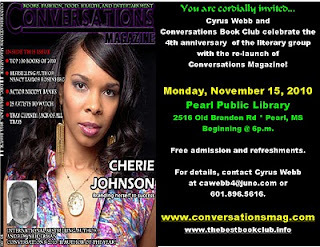 On Monday, November 15, 2010 Cyrus Webb invites the public to celebrate Conversations' 4 year anniversary at the Pearl Public Library (2416 Old Brandon Road) in Pearl, MS. <click the flyer below to enlarge> The event begins at 6p.m., and will include free refreshments as well as information available about what Conversations is doing to encourage reading not just in Mississippi but around the world. Webb is also using the event as a way to officially launch the return of his magazine Conversations. For more information about the event, contact Cyrus Webb at cawebb4@juno.com or 601.896.5616. 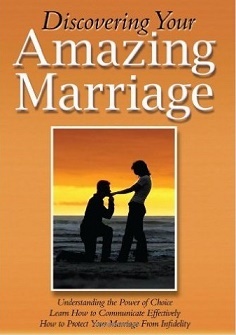 You can also visit www.thebestbookclub.info or www.conversationsmag.com. All right, here's an example of a richly flavorful, creamy, fat and calorie reduced alternative to Fettuccine Alfredo, Pasta with Lighter Alfredo Sauce, that uses evaporated milk instead of heavy cream (please see the last post for the incredible fat and calorie difference) and also adds a little garlic, shredded zucchini and an optional shot of balsamic vinegar for a fresh, zesty punch of flavor. I think this version of Alfredo Sauce tastes at least as good as the original version without leaving you in a fat-induced post meal, lead-weighted walking coma. Here's a shot of the ingredients you'll need - they're all very simple. …if you're using coarsely grated Parmesan cheese like what you see in the pictures above, please don't get discouraged if you notice the cheese and zucchini lump together when you start stirring all the ingredients together. Just keep stirring for a good minute or two so that the evaporated milk and cheese blend together smoothly as shown in the lower right picture. For complete, uniquely easy to follow step-by-step picture book directions, just click any photo on this page. For more from Chef Bruce Tretter, visit www.gotta-eat.com, and catch "Quick and Easy Cooking" on Conversations LIVE every Monday at 8:45p.m. est at www.blogtalkradio.com/conversationslive. 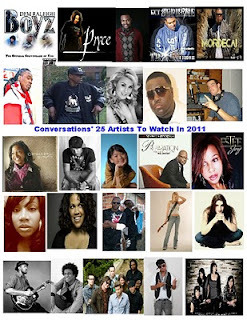 Cyrus Webb Presents "Conversations 25 Recording Artists To Watch In 2011"
Since Cyrus Webb began hosting Conversations LIVE radio show in July 2003, music has been a large part of the show's success. Over the past seven years he has not only been able to bring nationally recognized names to his listeners but in many cases introduce them to individuals who were on the rise or even outside of the genres they were used to hearing. * Row 1 (l-r): Dem Raleigh Boyz (Hip Hop/Rap), Pryce (Hip Hop/Rap), S. Green (R&B/Soul), Kut Supreme (Hip Hop/Rap) and Mordecai (R&B/Soul). * Row 2 (l-r): Young Dread (Hip Hop/Rap/Reggae), Corey Drumz (Hip Hop/Rap), Lora Pascarella (Rock/Easy Listening), Renaldo Price (R&B/Soul) and Big G (Hip Hop/Rap). * Row 3 (l-r): Cheneta Jones (Gospel/Inspirational), Jay Five (Hip Hop/Rap), Eva Sabiniano (Gospel/Inspirational), Marcus Jennings (Gospel/Inspirational) and EsTee (Gospel/Inspirational). * Row 4 (l-r): Kimistry (Hip hop/Rap), Chantal Ambroise (R&B/Soul), Hustle Boyz (Hip Hop/Rap), Lisa Bouchelle (Rock) and Lindsay Katt (Rock). * Row 5 (l-r): Tomas Doncker (Soul/Easy Listening/Inspirational), Joel Simpson (R&B/Soul), Lexington Field(Rock/Blue Grass), Kinesis (Hip Hop/Rap) and Mad June (Rock). Congratulations to all of the artists, and we look forward to seeing what you have in store for us in the new year. Conversations' "25 Artists To Watch In 2011"
They are making a name for themselves in Gospel, R&B, Hip Hop, Rock, Pop, Bluegrass and so much more. Shadow Play Entertainment in conjunction with Cyrus Webb and Conversations Magazine proudly presents its choices for the 25 recording artists to watch in 2011. At a time when many in the United States wonder if the American Dream is dead, singer/songwriter Abraham McDonald is living proof that with perseverence and faith it is very much alive. His journey into the ears and hearts of the world has not come without hard work and sacrifice, but in 2010 it has paid off in a big way. I was first introduced to the talented artist in late 2009 through Youtube, and it was obvious to me then what is clear to many today: he is not just a performer of music. He is the music. With every note he delivers not just something that is pleasant to the ears but sinks down into the psyche and touches the heart. The past year professionally has been a whirlwind that any individual who desires a career in the entertainment industry would long for, but I truly believe that for Abraham it is only a fulfillment of a vision that he saw for himself long ago. Life for him didn't begin with his winning Oprah's talent competition in 2009. It didn't begin with his signing a record deal with Island Def Jam records. It didn't even begin with the performances all around the world in the past several months. According to Abraham, it began when he was just a boy growing up in Texas when he realized that he had been blessed with a gift that if used properly could change not only his world, but that of those who would hear him. Conversations has interviewed numerous movers and shakers from various fields over the past seven years, but few have had the impact on listeners as has Abraham McDonald. That is why in my opinion, he is not just Conversations' Recording Artist of 2010, but a symbol to many of what can happen when you believe. In this interview with McDonald we talk about his life in music and what he believes others can take away from the rollercoaster ride of a lifetime that he is only just beginning. Abraham, you have had an amazing ride over the past year with appearances on Oprah, a record deal with Island Def Jam and performances around the world, but this journey has been a long one for you. When did you first realize that music was something you wanted to do as a profession? I don’t recall wanting to sing as a “profession” as a kid, I only knew that singing made me feel good and that I could see myself on stages. It’s in this season of my life, my right “now” that I’m discovering music/singing as a profession. And I’m loving it: the traveling, the smiles, and even the valleys that come with the desire of success. Singing is a well of things to me now. People hear you sing and they say that the words seem to come from your heart and your soul. That's a true gift. How do you feel when you see people respond so positively to something that you enjoy doing? This is one of the hardest questions I’ve been asked; more so because I can’t take credit for that amazing feeling of connecting in spirit. Ultimately that’s what true expression should ignite… an exchange, my gift for your wonderful energy… a complete cycle. I guess you could say that I feel complete when I hear positive responses to my sharing the gift. All I know is that I get to smile a lot. I've had the pleasure to interview you for the radio edition of Conversations, and each time we talked it seemed as though you were still humbled by what you have been able to do. That's not an easy thing to accomplish given the trappings of fame. In one interview you said that you saw yourself as a vessel. Can you explain that? I’m only as strong as my connection is to my source. I can’t paint a perfect picture because I’m nowhere near a perfect man. But, what I can do is tune in and respond accordingly. Without my connection I’m useless. I thank God as often as I’m reminded that I am placed by assignment and not by my own work. I'm sure you have seen some of your favorite singers on TV and thought about that being you one day. Your single "Miracle" has been getting rave reviews with the video debuting on Oprah.com, and I've already seen it on BET's Centric. Do you feel as though your career is coming full circle, and what can we expect from you next? I’ve been a thirteen-year-old boy, enjoying surprise after surprise and win after win these last 11 months. I can’t stop smiling, and though my sister and I have climbed a few mountains and even crossed a couple valleys, we are only at the beginning of the beginning of my new career. I’m grateful however that the dreams I recall now vividly, as a kid I had no idea that God had already begun to imprint those desires of my heart. It’s a wonderful journey to ride along and have the responsibility of getting out of the car where He stops. As far as what’s next…the world is before me and I plan to enjoy. My Christmas single, “Giving You My Heart For Christmas” is going to be what I believe is your next favorite Christmas song. Keep an ear out and start bugging your local stations NOW! My new single and album, “Man with Two Hearts" is slated for release in the first quarter of 2011. Be sure to keep tuning into www.mrabrahammcdonald.com you’ll find all touring information, music and photo/video updates there. Success is a word that is thrown around a lot, Abraham, and it means different things to different people. Given where you've come from and what you have done up until this point, what does success mean to you? Success is a personal word. It shouldn’t be flagrantly flung in front of anyone. I have no successes without peace. What I have been blessed to see and do in this new season of my life is only due to a mild trust in me that I believe my source wants to believe I can handle. Daily though, I work at my gift, I think about how my family will and can be blessed if I’m focused, and the truth is, I’m not always focused. (laughs) The success of it all is to be diligently connected to the mission laid before you. Only you know your true failures and successes. Congratulations again on all of your accomplishments, Abraham. We look forward to following you in 2011 and beyond. What advice would you give to those looking to you as an example about why they should follow their dreams? The only thing I can say about dreaming, is that self-belief is connected to trusting in your source. I was not created to lose. Pungent, maybe, but in truth, I believe in my heart of hearts that something special has been designed just for me to do, to become, and to share even. I sat on the side of my bed back in July of 2009, I said to myself, “I know there is more!" I began to search my heart and my memories. Who was I, who did I want to be, what did I want to do… I got to the place of completely trusting the leading of my source and I began to move, even before my Oprah experience. I didn’t wake up in Chicago and say, ”Well now this is it! This here! Now this is living” (laughs) No, I’d made a decision to live before that opportunity was even birthed. To the listener, the reader, I encourage you to seek the vision for your life, make a decision to live and then trust your source to direct you. Easier said than done…but check this out… Your 1% contribution is to follow, your source will hold down the other 99%. Pay attention and protect your thinking.